Since the emergence of Android, customization has become a massive fad. Now, everyone’s got a unique screen with customized widgets and their favorite home replacement. The latest Android devices have virtually nothing in common with the stone-age mobile phones of the past, where changing the background picture and ringtone was about the most you could do. In a blast from the past, we offer you Zedge Ringtones & Wallpapers, a real insider’s tip. Read further to find out whether it lives up to its reputation. The Zedge.net Community, with over 16 million users, has now finally made it big on the Android stage. With around 11,000 wallpapers and 370,000 ringtones, the Zedge App offers you an mind-blowing selection to suit anyone’s taste. The fact that there were almost 10,000 5 star ratings on the Market was a clear signal for me to test out this app. If you have a data plan with limited bandwidth, it is advisable to use this app primarily with your wireless connection. Otherwise, Zedge will quickly use up your data volume with its preview and download functions. Interested in some background pictures? Simply select wallpapers from the main menu to get a list of wallpapers with previews. Using the download button you can add the picture to your Android device and save it to your favorites list. Clicking the set button immediately sets the picture as your wallpaper. This one-touch navigation works for the ringtones as well. On top of it all, Zedge offers you a pretty good sorting feature. On the one hand, you can select how you would like your wallpapers and ringtones ordered. On the other hand, you’re free to select or exclude entire categories. The ringtone preview function is really something. By clicking on the little play button next to any ringtone, you can stream any tune directly on your phone. Once you find a ringtone you like, downloading is self-explanatory. Tabs at the bottom of your screen show you which wallpapers and ringtones you’ve downloaded or added to your favorites. And here comes the reason why I really love Android. Android gives you the possibility to use any app as a system default for almost anything, which makes so much sense. You can select Zedge as the default for all ringtone settings and access your downloaded ringtones from anywhere in the system. The transition is seamless and let’s you take full advantage of the preview function. 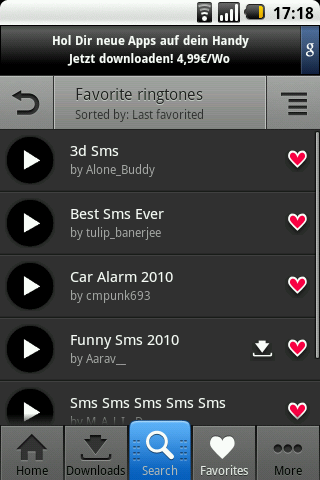 Zedge can therefore be incorporated into your Android ringtone settings menu. A pop-up menu lets you set-up Zedge as your default instead of the standard Android ringtone app. In the middle of your main menu, you’ll find a search button that can be pulled up into a full-size search window. There you can keyword search through over 300,000 wallpapers and 10,000 ringtones. In your settings, you’ll find a pretty tame „family filter“ feature. Activating it blocks certain unsavory content. Since you don’t need a password to deactivate this feature, it’s basically totally pointless. Nobody’s perfect and this app is no exception. You can’t, for example, import your own pictures to your wallpaper overview. Exporting or backing-up your favorites list is also out of the question. Basically, this means that you lose all your downloads and settings if you delete and then re-install your app, wipe your hardrive, or install a different OS. Your downloaded ringtones and wallpapers remain on your SD card, but you can no longer access them via Zedge. What a pity! The app’s navigation concept is really exceptional. As far as functions and looks are concerned, Zedge does an all-around great job. It’s really fun to browse through the selection and then download the latest ringtones and wallpapers. 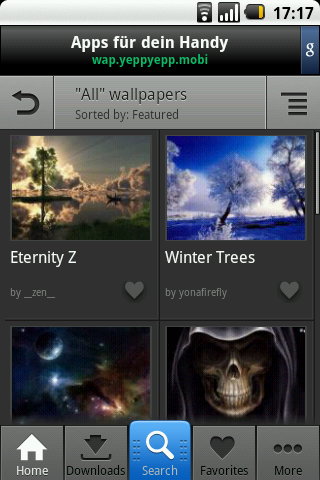 All in all, Zedge Ringtones & Wallpapers is highly recommended! The screen and menu set-up is great. Navigation is always based on the same simple concept. The search button at the bottom of the screen turns into a download button depending on the menu. There’s no need for you to constantly press the menu button. You’ll find everything you need right there on your screen. You’ll only ever need the menu button to sort through your favorites list. Now here is someone other app developers should learn from. Excellent! The app runs consistently well. Absolutely no crashes. The speed could be a bit faster at times, especially with the ringtone previews. This is understandable given the fact that the ringtones need to first load from the Internet. Zedge Ringtones & Wallpapers is available to download for free from the Android Market. 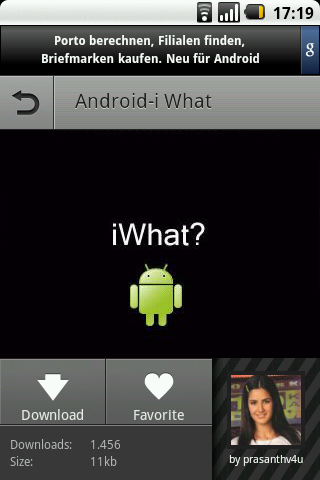 Nice app, now I can personalize my phone as I like it! I'm really happy to hear that! Thanks for your positive input. It's really nice to know that you've been checking our test reports. We really appreciate your support! Please share your thoughts on tests and apps. Looking forward to more comments and suggestions from you! I love this app. The test summary was excellent and details Zedges performance well. I didn't know that you lose all your downloads and settings if you delete and then re-install your app, wipe your hardrive, or install a different OS. Checking AndroidPIT (testing) prior to selecting an app has become a habit. I find this site so very valuable and interesting!